Packed up travel information about the Swedish city, Uppsala, including it's attractions, sights to see, areas to dine and shop as well with its excursions. One of the most historical and traditional cities in Sweden, Uppsala has been captivating the visitors with its scenic look and one of a kind atmosphere for a long time now. Generally known as the birthplace of the magnificent Ingmar Bergman, the cult Swedish director, this little Swedish city has contributed to both Sweden’s and Europe’s intellectual attitude more than any other Scandinavian city. Another point that must be mentioned about this city is that it’s being home to the oldest higher educational institution in Sweden, which is the Uppsala University. Today, with the joinery of other predominant universities, the city has strengthen its academic profile even more. Despite Sweden’s general demographical profile, Uppsala has got a notable young population because of being an education city. The total population of Uppsala is around 140.000 and because of the number, it is almost impossible to come across traffic jams even in the busiest hours of the day. Uppsala may seem as a city that doesn’t offer much to its visitors however once starting to discover the city, one is going to prove himself wrong and it will not take so long. The city is one of the best places to observe the Swedish way of life as it is not a metropolitan and the locals are still committed to their cultural roots. In addition, surprising for such a small city, it has got a large range of attractions to choose from. No matter for what purpose you are about to visit this beautiful Swedish city, this city will remain in your heart forever. With its scenic looking houses, relaxed way of living that is surrounded by one of a kind nature, Uppsala is a great city to visit to get to know Swedish way of life even better. 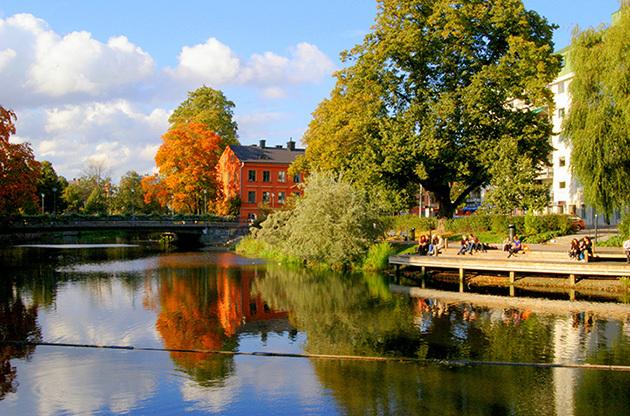 Uppsala is located 40 km north of Stockholm which is located on the eastern part of Sweden. How to get to Uppsala? Uppsala doesn’t have an airport on its own however, it is still one of the most accessible cities to reach, especially if you are travelling from Stockholm. Stockholm Arlanda Airport is located only 35 km from Uppsala center. Once arrived in Arlanda, you can choose the bus or the train service that leaves from the airport or the Stockholm Central Station. Stockholm Skavsta Airport, which is a hub for low cost airlines, is used while reaching Uppsala, too. That’s a bit harder to reach the city from Skavsta as it is located 170 km from Uppsala. However, Nyköping Central Station provides the travelers with a large number of busses and trains to Uppsala, every day. Th city may not be a metropolitan but that doesn’t mean it cannot make you experience one of the most unique journeys of your life. From places to see to shop, it gives you the chance to get to know this city as it is compact, even if you are short on time. If you want to get to know this beautiful city and its history, a walk to city center and its surroundings will do it for you. Gamla Uppsala (Old Uppsala) has still marks of the pre-Viking period and you can see a lot of old Swedish Houses there. Uppsala Castle will take you to 16th century and you will have an insight about the way of living during those times in today’s Scandinavia. Uppsala Cathedral, Uppsala University, Botanical Gardens and Uppsala University’s main building Carolina Rediviva must also be included in your list to see in the city. If you want to visit a couple of museums, The Uppland Museum and Uppsala Konstmuseet might be good choices. Svartbäcksgatan, which is located really close to Uppsala Central Station, is the main shopping area in town. You can find little stores selling souvenirs and stores of the Swedish brands’ there. Stora Torget is the square within the area. It is only for pedestrians and you can also find nice cafes to fika, after the hours of extensive shopping. Gränby Centrum is the biggest mall in the city and gives the chance of easy shopping, as you can find anything you look for in one place. As Uppsala is a city where most of the population is students, high end dining options are not many to come across. However there are still good quality restaurants, especially in down town, serving a lot of different cuisines. For the same reason of high end restaurants not being abundant, the city has got a good nightlife scene for university students, however if we are to name some classy bars, we cannot. Still, having a drink down town will make you understand the nature of the city even better. If you have some more free time to spend in the city, you may consider taking a boat trip on the river Fyrisån if the weather lets you. If your trip is going to be on the first week of April, then you must attend the Valborg celebrations. During the winter, you can watch a game of Bandy, the famous Swedish sport at the Studenternas Idrottsplats (Student’s Sports Hall). If you haven’t seen Stockholm before, making a day trip to the capital is also a good option, as it is really easy to reach. Uppsala is the third city that hosts the most international congresses, conferences, symposiums, exhibitions, fairs and tradeshows, after Stockholm and Gothenburg in Sweden. The expanding bed space in the good quality hotels, the ease of transportation in the city and the venues that are equipped with the latest technology, turns Uppsala’s face to be a strong nominee in the world’s event tourism scene.